Great for a growing family. We love our Xterra. It is great for our small family. It has been super reliable and comfortable on long road trips. Plenty of room for large grocery trips, car seats fit well, and we always feel safe while driving it. Our Xterra handles really well on ice and snow. This is the second Nissan vehicle we have purchased used (the first a Sentra). Our Nissan vehicles have by far been the most reliable, lasting vehicles that we've owned. Our only reason for selling the Sentra was that we needed something larger to have enough room for two carseats, our 80-lb black lab, and still have room for clothing, etc. When we go on road trips out of state to visit family. 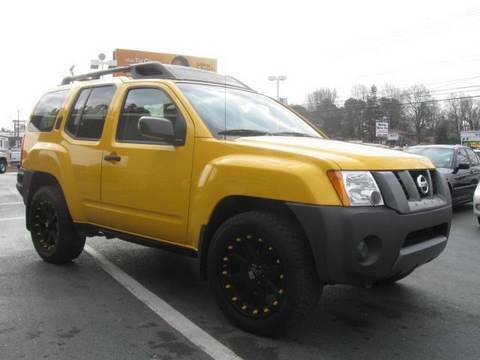 The Nissan Xterra adapts well to varied terrain and weather conditions. I love this vehicle, it is economical, pretty much maintenance free and a joy to drive. With today's gas prices the cost for fuel has really not been a factor. This vehicle is roomy and quite comfortable. I chose this vehicle because I like the brand, Nissan is a great brand and not too costly when making repairs. The weather in my area is very unpredictable and the Xterra adapts well to all. Nissan is at the top of my list when looking to purchase a vehicle. Solid vehicle, great interior space, love the style and functionality. I love the size and style of my SUV. It hauls well and performs well in all 4 seasons. What I do not love is the gas mileage. I have also read online that a lot of the sensors are faulty, which has proven true for me. Even though my tire pressure is accurate, the sensor light is always on. Also, my gas sensor malfunctions stating I am low on gas even when my tank is full. Other than those issues, for a 12 year old vehicle, it is solid.